Dan K Lowring, CLU joined Guardian in September 1966 as a Unit Manager and a Field Representative. He served in a Dual capacity for many years and went back into Full time personal production in 1973. He qualified for the Million Dollar Round Table (MDRT) the next year and is now a life member with 42 years of membership. He retired as a field rep July 1, 1999 and continues currently as a broker. He has qualified for Guardian’s Leader’s club numerous times as well as many other industry awards. He received his CLU designation in 1970 and and became a Registered Rep in 1974. He has been active with the Indianapolis Association of Life Underwriters throughout his career. First as a Chairman of many Committees and a Board member and proceeding through the chairs to the office of President of the Board in 1976-1977. He didn’t stop at the state level and later served many years in several capacities on the National Level. He was also active in the American Society of CLU and CLFC. First as a board member, 1976. He served in every office and was President of the Indianapolis CLU Chapter in 1983-1984. He then served as President of the Indiana State Association of Life Underwriters in 1984-1985. In 1988 he received the Hoosier Life Underwriter of the Year award from the Indiana State Association of Life Underwriters. 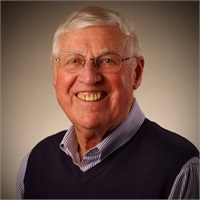 During this time he was active in the community with Big Brothers of Greater Indianapolis as a board member for 25 years, a Big Brother to three different little brothers, a committee chair and as President. He is a member of Sertoma, a Service Club who’s moto is Service to Mankind, for over 40 years and President of his club in 1979-1980. He has been a member of St. Luke’s United Methodist Church for 46 years and remains active.